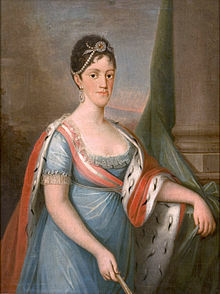 1802 painting o Carlota Joaquina bi Domingos Sequeira. Doña Carlota Joaquina o Spain (Carlota Joaquina Teresa Cayetana; 25 Aprile 1775 – 7 Januar 1830), was by birth a member o the Spanish branch o the Hoose o Bourbon an an Infanta o Spain an Queen consort o Portugal an the Algarves bi mairiage (an later o the United Kinrick o Portugal, Brazil, an the Algarves). She wis the wife o John VI o Portugal. 25 April 1775 - 8 May 1785: Her Ryal Highness Infanta Dona Carlota Joaquina o Spain. 8 May 1785 - 11 September 1788: Her Highness Infanta Carlota Joaquina o Portugal. 11 September 1788 - 20 March 1816: Her Ryal Highness The Princess o Brazil, Duchess o Braganza. 20 March 1816 - 15 November 1825: Her Most Faithful Majesty The Queen o the United Kinrick o Portugal, Brazil and the Algarves. 12 October 1822 - 15 November 1825: Titular Queen o Brazil. 15 November 1825 - 10 March 1826: Her Imperial an Most Faithful Majesty The Queen o Portugal an the Algarves, Empress o Brazil. 10 March - 2 May 1826: Her Imperial an Most Faithful Majesty The Queen Mother of Portugal an the Algarves, Empress o Brazil. This page wis last eeditit on 15 Apryle 2019, at 13:30.